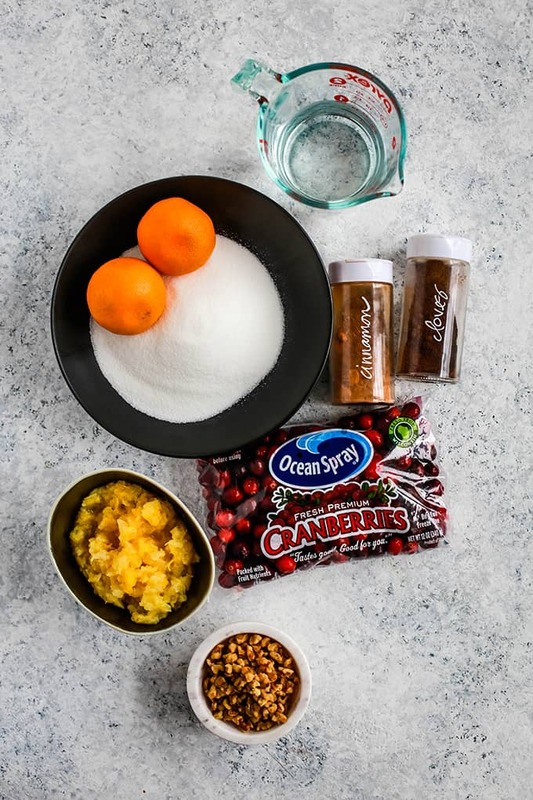 This amazing seven ingredient Citrus Cranberry Sauce is the easiest holiday side dish to grace your dinner table, with a bright and flavorful twist on an otherwise traditional dish. Original content posted November 2013. Updated November 2018. I’ll be honest. 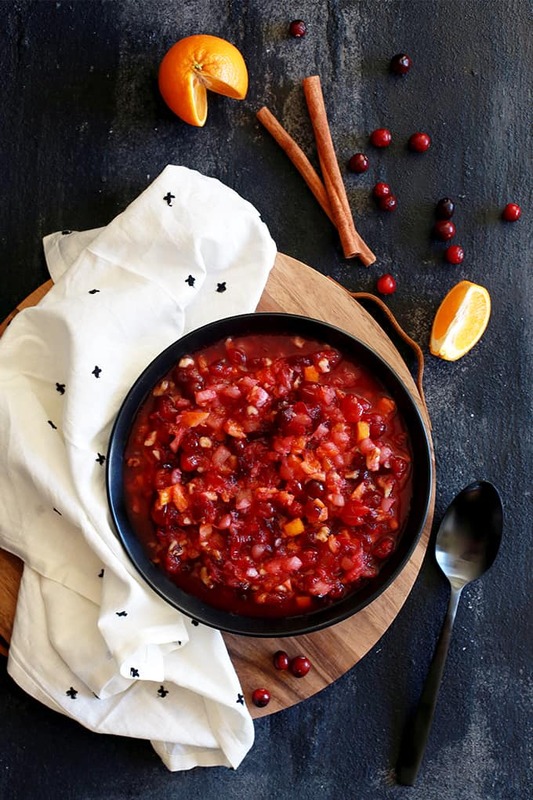 When I first introduced this Citrus Cranberry Sauce to our Thanksgiving dinner menu, I only did so because in my mind, it’s something you just have to have. Cranberry sauce that is. It’s tradition. Although I don’t recall ever having it at any of my holiday dinners growing up, it’s something that I really wanted to introduce to my own dinners now that I was making my own menu. And believe me, I’m so glad I did! 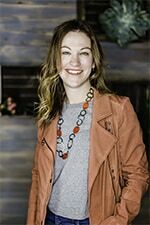 For our first Thanksgiving in Wisconsin, seven years ago, I was working in the craft industry and my supervisor at the time shared her Citrus Cranberry Sauce recipe with me. Her original recipe used oranges but I made the switch to clementines as they’re something I always have on hand during the holidays and that means one less ingredient to buy. Plus they just taste better in my humble opinion! I also love that you’re able to make it a couple of days ahead of time to not only to get a jumpstart on your holiday meal prep, but to allow the flavors to fully develop as well! 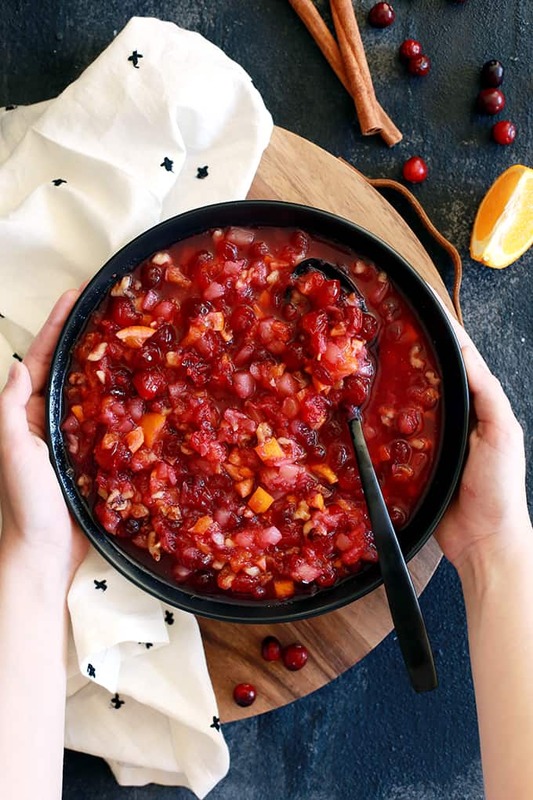 This amazing seven ingredient Citrus Cranberry Sauce is the easiest holiday side dish to grace your dinner table. Bits of citrus packed clementines, tart cranberries and sweet pineapple are stirred together and then spiced with both cloves and cinnamon to create a bright and flavorful twist on an otherwise traditional dish. It’s obviously delicious on it’s own, but I also love it warm as an amazing topping for my Yogurt Waffles or Vanilla French Toast. Leftover sauce is also the star of my Cranberry Cobbler Muffins. The perfect day after Thanksgiving breakfast or brunch treat. 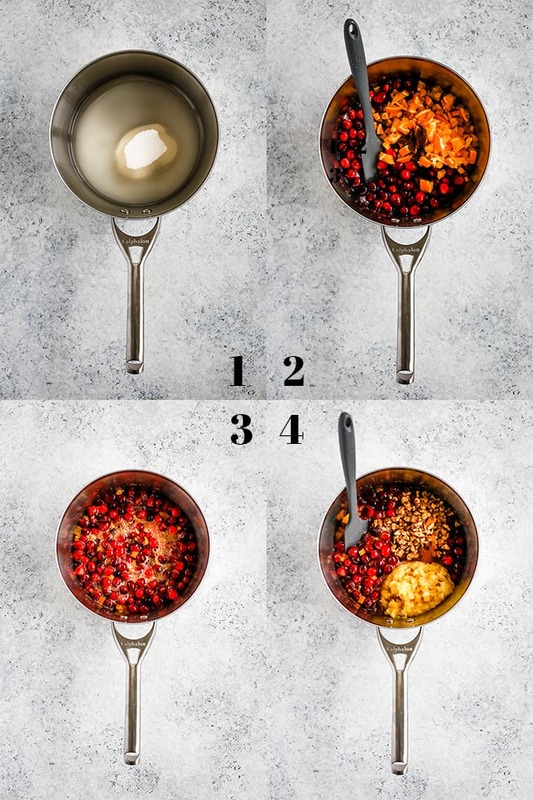 Add cranberries, clementines and cloves to saucepan. Simmer over medium-high heat, stirring frequently until berries pop open. Stir in pineapple, walnuts and cinnamon and remove from heat. Cool and serve. Add cranberries, clementines and cloves and simmer over medium-high heat, stirring frequently until berries pop open. Stir in pineapple, walnuts and cinnamon and remove from heat. Looking to infuse even more cranberry flavor into your holiday meal? Your guests would love to see this vibrant Cranberry Gingersnap Pie, crowd pleasing Cranberry Fluff Salad, this tart and spicy Cranberry Pepper Jam or this sweet Nutty Oatmeal Cranberry Bars recipe on your table. Nothing beats homemade cranberry sauce and this sounds delicious! The best cranberry sauce is always homemade. This looks delish! 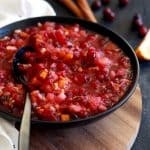 How inviting this cranberry sauce looks! This will be a winner in our house! Homemade cranberry sauce is always better! 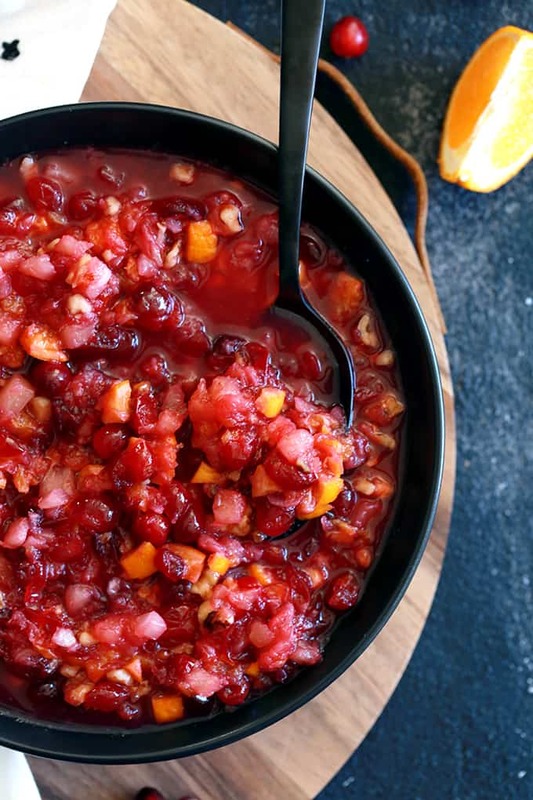 This citrus cranberry sauce is perfect for the holidays! This looks so fresh and delicious! Love the addition of the clementines! 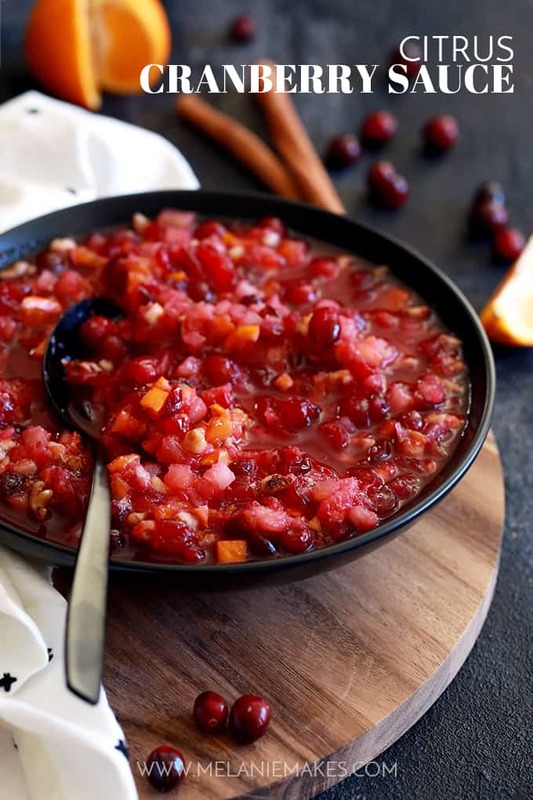 I love that this cranberry sauce has such a great citrus infusion! I'm definitely going to be trying this on Thanksgiving! Can't wait to hear what you think, Jen! This is no ordinary cranberry sauce! I love all the extras that push this over the top!! Happy Thanksgiving! Thanks so much, Liz - Happy Thanksgiving to you! This sauce looks amazing! I am going to have to add it to my Holiday menu! I have no doubt you'd love it, Amy! This sounds amazing! I will be saving this for the holidays. Thanks so much, Des - hope you enjoy it! O(MG! Looks divine and sounds so tasty! I love all these flavors! It's one of my favorites, Abeer! Oh my goodness, this sauce looks incredible! This may be the prettiest cranberry sauce ever! I'm all over the refreshing citrus - love it!!!! You're so kind, Jenn - thank you! So perfect for the holidays! Love that extra kick from the citrus! Thank you so much - I love eating it warm. So comforting! Sounds great Melanie - I was also wondering about not peeling the Clementines, but your reply makes sense - it would add so much flavor like zesting it would. I am going to make this for Thanksgiving dessert over Vanilla Ice Cream!! ThanksPs - Enjoy your Holiday! Definitely let me know how you like it, Doreen - so honored you're including it in your Thanksgiving menu! If you have leftovers, it's also great on waffles and pancakes! sounds easy and delish! thank you!! Do you really not peel the clementines? It looks divine but I can't stop thinking about the peel of the clementine in it. You really DON'T peel the clementines! They turned into something similar to a candied peel and honestly you couldn't pick them out when you were eating them from anything else. Promise!